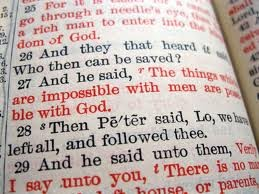 Have you ever sat and read through the New Testament and read ONLY the words in red? Jesus’ words. For a completely new perspective, I challenge us to do just that. I know context is everything, but step out of the exegesis box (interpreting the scriptures) for a brief moment, to get an amazing snap shot of Jesus. His strength, authority and tenderness.His love, and compassion. Without all the narrative, those red words pack a powerful punch, knowing that Jesus says them. There are dramatic statements, strong commands, tender words. “Let it be so…” (Matt. 3:15) “It is written…” (Matt.4:4) “Get up…” (Matt. 9:6) “Take courage it is I…” (Matt 14:27) “Quiet, Be still…” (Mark 4:39) “Come forth …” (Jn. 11:43) “Don‘t be afraid just believe…” (Mark 5:36) “What do you want Me to do for you…” (Mark 10:51) “Who do you say I am…“ (Lk. 9:20) “Then neither do I condemn you…” (Jn. 8:11) “I am He…” (Jn. 18:6). It is finished. The word in the Greek alone paints the most vibrant color filled picture: “To complete something not merely to end it, but to bring it to perfection or its destined goal”* As the pages turn from Genesis to this very moment, God’s story is fulfilled. Does it end here? No. But the bridge back to the Father is perfected. Jesus rises from the dead triumphantly (Happy Easter) engages and commissions the disciples, returns to heaven to reign forever. Now we the church, as inspired by the Holy Spirit, carry on with the red letter commands, statements and tender words. Move over Easter Bunny, here comes the risen King! 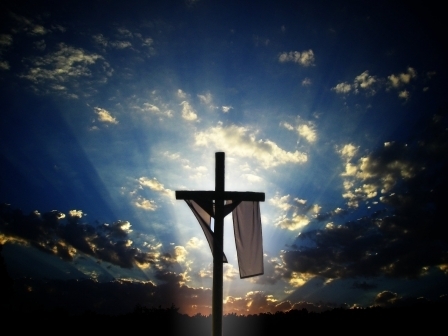 “It is finished.” Now lets live like it really IS! Relationship offered, relationship restored. May we live each day as a red letter day! This entry was posted on April 7, 2012 by Inspired Fountain. It was filed under * Miscellanous Stuff and was tagged with Easter Devotion, Its is finished, Redletter Day.